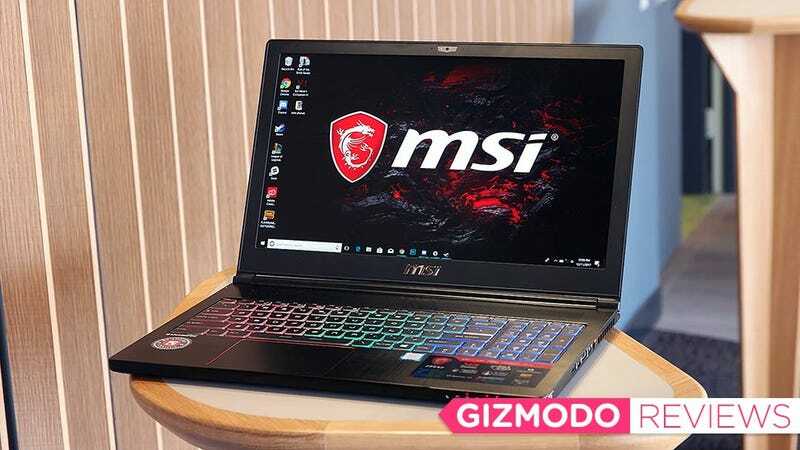 A couple months ago I reviewed MSI’s GT75VR, and even though I respect how hard it is to cram desktop-level components, ridiculously loud speakers, and a custom mechanical keyboard in a laptop body, gigantic 17-inch systems like that don’t really do it for me. That’s because weighing in at almost 10 pounds and measuring 2.3-inches thick, the GT75VR doesn’t really deliver the portability I expect from a gaming laptops. With a starting price of $2,700, it sure as hell ain’t cheap either. But the GS63VR Stealth Pro is a whole ‘nother story. It’s slim, it’s sleek, and it’s got one of the most colorful RGB keyboards out there—all starting at $1,500. At 3.96 pounds, and 0.7-inches thick, the GS63 isn’t much bigger than a 15-inch MacBook Pro, so you won’t have trouble sliding it into most backpacks or messenger bags. In fact, the most annoying thing about traveling with the Stealth is finding room for its powerbrick, which weighs half as much as the laptop itself. But then, I remember 17-inch GT75VR, which practically requires a carrying case with wheels, and I’m downright grateful to have something that came play games properly and is still this thin and light. The Stealth Pro’s lid also flexes like crazy, but durability wasn’t really ever an issue. I was much more concerned about picking up scratches or fingerprints, the latter of which were constantly showing up on the system’s smooth brushed aluminum finish. Along the sides, there’s a plethora or ports, including USB-C with Thunderbolt 3, HDMI and DisplayPort, and even Ethernet, because the last thing you want while gaming is lag. The sides of the system feel much more substantial, and little touches like the row of indicator lights and icons are a quaint touch, even if they are a little outdated in 2017. MSI even puts a handy layer of microfiber across the bottom, which helps keep the system in place when you’re frantically slamming the keys, and also protects your legs on those occasions when you actually use this thing on your lap. MSI’s backlit keyboard is also one of my favorite typing solutions available on a notebook. Not only can the RGB lights be set to pretty much anything you want, MSI managed to include both a numpad and full-size arrow keys, which are both becoming rarities nowadays. MSI has even moved the Windows key over to the right of the Space bar, so you don’t hit it accidentally while gaming. Unfortunately, that big display, Core i7 CPU, and Nvidia 1070 GPU all take a toll on battery life. On our rundown test, the GS63VR lasted just 3 hours and 48 minutes. That’s far short of the eight to ten hours you’d get from 13-inch ultraportable, though it’s not that much worse than the 4:10 posted by the Razer Blade Pro. It’s tough keeping this thing looking super clean, as the lid picks oils from your fingers like crazy. The location of the power button is somewhat unusual, but it doesn’t take long to get used to. 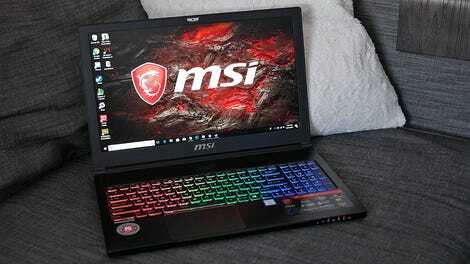 Our review unit also came with MSI’s optional 15-inch full HD 120Hz display, which is certainly nice, but you don’t really need it, as it adds about $200 to the price of the system. And unless you’re the kind of person who turns all the settings down as low as possible in the quest for more FPS, you’re probably not going to able to full take advantage of that 120Hz refresh rate. During benchmark testing, I found that the GS63’s Max-Q Design 1070’s performance is closer to that of a regular 1060 than a full 1070. On Rise of the Tomb Raider at 1920 x 1080 and high settings, the GS63 hit 80.7 fps, which is practically the same as the 81.8 fps we got from the Razer Blade Pro and its Nvidia 1060 GPU. Otherwise both systems featured almost identical specs, including an Intel Core I7-7700HQ CPU and 16GB of RAM. On Civilization VI, the GS63VR hit 55.8 fps versus 54.7 for the Razer Blade Pro, which again, is essentially the same. It’s not super surprising to see the Max-Q 1070 struggle to outperform a standard 1060, after all, Max-Q GPUs are designed with an emphasis on power and space efficiency rather than all-out performance. However, this means there’s no real point in spending top dollar for a GS63VR with a Max-Q 1070, when you can choose the model featuring a 1060, which has practically the same performance, for several hundred less. But you know what? That’s just fine. When it comes to my perfect gaming notebook, I’m not actually looking for outrageous performance. What I really is something that will let me play the same games I enjoy at home, in a package that travels well on the road. It doesn’t hurt if it looks nice too. And for me, the GS63VR is just that. The hidden power indicators lights are a nice touch too. The top of the line Max-Q Nvidia 1070 GPU performs closer to a regular 1060. Battery life is pretty mediocre at slightly under four hours, though for a system this powerful that’s actually not that bad. The 120Hz display option is nice but it isn’t a necessity. MSI’s RGB keyboard is super colorfulful, and quite comfortable too. 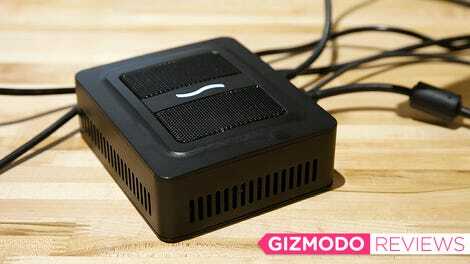 This thing is a fingerprint magnet.